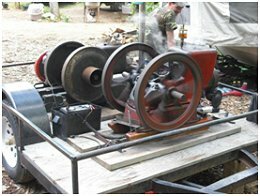 Enjoy the Allegheny Mountain Engine & Implement Association’s (AMEIA) yearly demonstration in Port Allegany, Pennsylvania on the fourth weekend in July at the A.M.E.I.A. grounds on Route 155, 1 mile south of Route 6. Three days of demonstrations, parades, flea market, vendors, pie making contest, raffles, crafts, and contests are fun for the whole family. 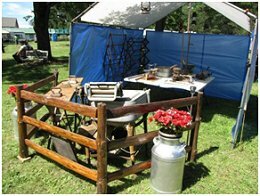 Displays include magnificent Allegheny mountain engines including Oil Field Apparatuses, Agriculture Implements, sewing and old washing machines, Lumber Industry Equipment, and Road Building Equipment. If you have an interest in preserving and restoring old engines and implements become a member. They take great pride in showing antique engines at various shows and demonstrations such as the AMEIA Annual Show which is held yearly in July. Other shows include the Bark Peeler’s Convention held the Fourth of July weekend and the Lumber Museum Show. The Allegheny Mountain Engine and Implement Association was formed in 1975 to preserve the past for future generations to enjoy all over the Twin Tiers. It is not necessary to own antique engines or equipment.